Did Judge Redfield T. Baum make the right decision in tossing out Jim Balsillie's bid for the bankrupt Phoenix Coyotes while leaving the door ajar for the NHL's bid? What's next in this complicated case? For the answers, we turned to Richard C. Powers, the associate dean of the University of Toronto's Rotman School of Management. The Phoenix Coyotes saga took a major turn Wednesday as U.S. Bankruptcy Court Judge Redfield T. Baum rejected both offers to buy the financially ailing franchise: one from Canadian billionaire Jim Balsillie, the other from the NHL. Well, sort of. While Balsillie's bid was tossed outright, the NHL was given the opportunity to amend its proposal, and chances are the league will end up owning the Coyotes. Facing long odds and an even longer fight if he chose to continue his quest, Balsillie quickly announced he wouldn't appeal Baum's decision, saying he's content in the belief that he's brought Canada closer to landing a seventh NHL club. Is this really the end of the road for Balsillie? Did Judge Baum make the right decision? What's next for the Coyotes? For answers in this complicated case, we turned to Richard C. Powers, associate dean of the University of Toronto's Rotman School of Management. CBCSports.ca: What does this decision mean? Richard Powers: The NHL now controls where the team goes, and who owns it. That's the basis of the judge's ruling. He recognized their exclusive right to determine that against all counter-arguments, including anti-trust and competition law issues. CBC: Balsillie's bid was rejected "with prejudice," while the NHL's was rejected "without prejudice." What does that mean? RP: That's the judge telling Balsillie, 'Your bid is not acceptable to the court, and the only way it could become acceptable is if you were to secure the blessing of the NHL.' And let's face it, that's not going to happen at any price. CBC: In the eyes of the judge, how important was it that the NHL's board of governors voted unanimously to reject Balsillie as a potential owner? RP: That was huge. In the end, that's what swayed the judge. CBC: Balsillie announced he won't appeal the decision. Did he have any other options? RP: Not unless he could convince a court to take a look at anti-trust — or, in Canada, competition law — issues. That was his only recourse, but I'm not sure he wanted to go there. Balsillie has spent a considerable amount of time putting this bid in and fighting this battle. He's got a company to run. How much more time would he be willing to put toward this? CBC: Meanwhile, the NHL is still in the running if it amends its bid. What does the league need to do to close the deal? RP: Increase the amount of money, and they've got it. But the judge didn't put an amount in his decision, which I think is a poor one. He had more than enough information to put a figure on it and he chose not to. CBC: Baum expressed concern over the NHL's omission of Coyotes majority owner Jerry Moyes and former head coach Wayne Gretzky on its list of creditors to be paid. How significant of an issue is that? RP: The judge is saying that you don't get to choose who the creditors are. That's our job. And you haven't got it right. So go back, include those guys, come up with some more cash, and the team is yours. The door is open for the NHL as long as they're willing to pony up some more cash. 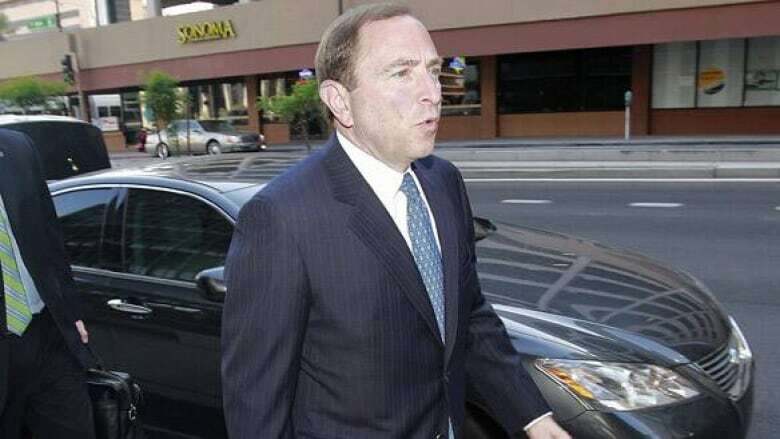 CBC: How much will the NHL have to tack on to its $140 million US bid? RP: Balsillie's $242.5-million bid included $50 million for the City of Glendale, but the NHL is going to keep the team there, so they don't have to pay Glendale anything. So if we use Balsillie's bid as a benchmark, take out $50 million and you're somewhere in the ballpark. Something like $190 million is a best guess at this point, but again, there was no direction from the judge. CBC: The fact that its bid was rejected notwithstanding, it looks like the NHL is the winner here. And Balsillie is the loser. Anyone else figure into the equation? RP: The City of Glendale just turned down $50 million from Balsillie, and now they're going to get squat. They'll get lease payments this year, then they're toast. CBC: The NHL has indicated it would be open to allowing the Coyotes to move as early as next season, once the team is in the hands of a new owner. Is the team done in Phoenix? RP: The team isn't going to stay in Phoenix. Look at those losses. I think what will happen is the NHL will underwrite the team in Phoenix this year while negotiating a move. They'll control the destination and who the owner is. CBC: What do you think of Judge Baum's decision? RP: The day before the season starts? It's the wrong decision. It's unfair to the team and all the stakeholders involved. CBC: Is it surprising that he leaned on the fact that the NHL didn't give Balsillie approval to own the team or move it to Hamilton? RP: It's surprising only in that that doesn't come under the purview of a bankruptcy judge. But this has been about a lot of issues that would not normally come up in a bankruptcy court. His reading of the law is self-serving for the most part, so that he doesn't have to deal with these contentious issues. CBC: Baum seemed nervous that if he awarded the team to Balsillie, he would set a precedent that would strip the NHL and possibly other pro sports leagues of the ability to choose where their team play. RP: But that's the point. He didn't have to. All he had to do was make the decision on the bankruptcy proceedings. Another court would've decided on the relocation issue. CBC: It seems like Baum did everything in his power to avoid making a concrete decision. RP: I'm not sure about that. He wanted to be fair and give everybody an equal opportunity to present their arguments. Sometimes insisting on more information and not ruling immediately is a good thing. His decisions before today had been reasoned and on point. But on this one he just bailed. BLOG: Morrison: What's next for Balsillie, NHL, Coyotes?